Heat treating is a thermal process used to alter mechanical and chemical properties of metal objects. Most magnetic shielding components require heat treating to restore and/or enhance magnetic shielding performance, so it only makes sense that MuShield operates a heat treating facility on-site. 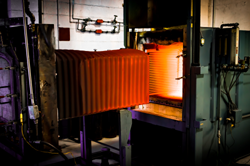 MuShield utilizes hydrogen heat treating furnaces, which yield superior shielding quality in the heat treated piece parts. Magnetic shielding components are heated to 2100°F in a dry hydrogen atmosphere and eventually cooled back down to room temperature. Hydrogen is a reducing gas and removes surface impurities such as carbon and oxygen. The resulting metallurgical structure produces maximum permeability and shielding effectiveness. 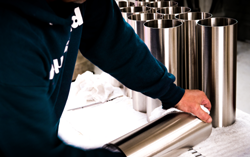 Why choose MuShield for your hydrogen heat treating needs? Already have a finished good that needs to be heat treated? MuShield does not only heat treat our own parts, but also offers hydrogen heat treating service on outside parts on a contract basis. MuShield is an approved heat treating vendor for many companies in the military, medical and aerospace industries including BAE, NASA, Johnson and Johnson, Raytheon, JPL to name a few. Contact us at info@mushield.com with your RFQ today!